Religion is a controversial topic. Not only do believers and atheists have strong (and opposing) feelings on the subject, but there because it hinges on the question of faith, by definition it is difficult to draw conclusions based on empirical evidence (my favorite mode of thinking). I know two things that are definitely true. The first is that I am not particularly religious. This should come as no surprise to those who have heard Ben Casnocha and I talk about establishing a secular church. The second is that many of those figures I admire most were devout believers (Abraham Lincoln comes to mind) and wrote about how they drew upon their beliefs to sustain them in their lives. These facts have always struck me as somewhat contradictory. A series of things I've read over the past few weeks keep swirling around in my head, and I can't stop thinking about how they seem to fit together in ways simultaneously unexpected and natural. It began, oddly enough, with Mr. Rogers. I just finished reading "I'm Proud of You," writer Tim Madigan's book about his friendship with the remarkable Fred Rogers (himself an ordained minister). It is a wonderful book, and I won't spoil it for you by telling too much of the story. Suffice it to say that when Madigan calls Rogers "a man of historic goodness," he'll get no argument for me. The core of Rogers' greatness was his incredible caring. Madigan opens his heart to Rogers, showing all his flaws and making himself vulnerable. And Rogers, remarkably, is able to both acknowledge those flaws yet still provide sincere, powerful, and unconditional love. The title of the book, "I'm Proud of You," comes from a letter Madigan writes to Rogers, desperately seeking his approval, yet feeling unworthy. Rogers doesn't dismiss Madigan's flaws and failings (like our friends often do, in an effort to be kind) but he doesn't punish or excoriate either. He simply sees the good in Madigan as well, and signs all of his letters with, "I'm proud of you." I've written recently about how all of us feel like imposters, like we're not worthy of the regard others have for us. We all want someone to be proud of us, yet no matter how much we achieve, we never seem to get to that magical safe place. And when someone tells us how wonderful we are, our mind rebels. "If only you knew me the way I knew me," we think, "You wouldn't be so full of praise." He didn't absolve them; while we crave absolution, we know ourselves too well for absolution to feel real. His genius was to convey a simple, yet powerful message. "You are struggling. You sometimes fail. But despite those things, I love you, and I am proud of you." 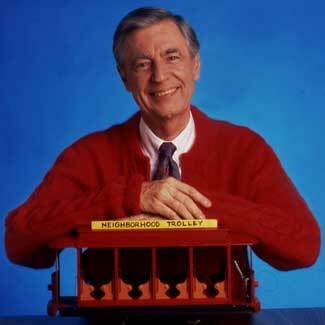 In case you can't tell, I'm a big Mr. Rogers fan. And as I examined my own feelings about Mr. Rogers, I began to feel that perhaps this was how the truly devout feel about their deity. A figure of overwhelming goodness and wisdom, who knows my deepest, darkest secrets, yet loves me anyways. A caring force that accepts me for who I am, yet also helps me to be a better person. Doesn't that sound like the kind of relationship that believers want to have with their God? The next thread came from Walter Kirn's piece in The New Republic, "Confessions of an Ex-Mormon." This moving piece details Kirn's relationship with the Church of the Latter Day Saints, from his family's conversion at a time of crisis during his childhood, to his leaving the church, to fascinating quasi-return to the community during his mid-life crisis. Kirn, who isn't a member of the church, nonetheless paints what is ultimately a sympathetic portrait of a religion which is less about its beliefs (which he points out can be odd, and aren't always universally believed even by church members) and more about an old-fashioned kind of community that seems to be hard to find these days. My life has been spiraling down these past few years. A divorce from the mother of my two kids. Fat medical bills from repeated bouts of kidney stones, which are one of those puzzling ailments you blame yourself for because the doctors can’t tell you what else to blame. A dwindling income due to a contraction both of my stamina and the publishing industry. I’m using Ambien to sleep, Ritalin to yank me back awake, and three varieties of narcotic pain pills to keep me from going fetal on the sidewalk when the stones start axing through my ureter. I’d forgotten that social life could be so easy. I’d forgotten that things most Americans do alone, ordinary things, like watching television or listening to music or sweeping a floor, could also be done in numbers, pleasantly. One night, I sat on the floor next to a kid, muscled and tall, rectangularly handsome, who turned out to be a quarterback for UCLA. I learned this from Kim; he’d never bothered to mention it. Too absorbed in the goofy talent show, too busy barbecuing chicken breasts or squirting Hershey’s Syrup on bowls of ice cream, assembly-line style, while someone else stuck spoons in them. At Beverly Zion, that’s how it worked: pitch in, help out, cooperate, cooperate. One day, in the car ride back from a housemate's wedding (the marriage took place just weeks after the couple met), Kirn's girlfriend Amanda (a Catholic) tells him, "I give up: I want to join." I was struck by the similarities between Madigan's experience with Fred Rogers and Kirn's experience with the Mormons. In each case, a troubled intellectual turns his life around thanks to the compassionate caring of devout friends. The Mormons don't proselytize; they simply accept Kirn, even though he admits to carousing on the Sunset Strip until dawn and lives in sin with his girlfriend, and show him caring and kindness. Both Madigan and Kirn had isolated themselves (as many writers do); Rogers and the Mormons made them part of a community again. That's where the third thread comes in. Like many people, I read Alex Williams' piece in the New York Times, "Friends of a Certain Age: Why Is It Hard to Make Friend Over 30?" As I read this, I can't help but think back to Mr. Rogers' gentle push for emotional intimacy with Tim Madigan, and the sense of community ("proximity" and "repeated, unplanned interactions") that the Mormons provided to Walter Kirn. I can't speak for women, but among men, one's close friends provide the same kind of paradoxical support as Mr. Rogers and the Mormons. My friends know my various flaws, and are quick to point them out. Much of male bonding consists of busting one another's asses with friendly insults and embarrassing stories. Yet underlying it all is a sense of acceptance and brotherhood. The unspoken message is simple: "You're a fuckup, but I love you anyways. Let's grab a beer and hang out. Just don't sleep with my sister." When Robert Putnam wrote "Bowling Alone," he argued that the decay in community institutions (such as bowling leagues) was isolating people and making them angrier and less empathetic. Yet while his concept of declining social capital is a powerful one, I always had problems with finding solutions to the challenge. I don't think we can turn back the clock to an age where people lived their entire lives in a small town, and attended Rotary Club meetings every week. Putnam thinks that the entry of women into the workplace contributed to these changes; I doubt many of us want to go back to 1950s chauvinism. But when I consider "Bowling Alone" in the context of faith, community, and friendship, I think I start to see a different solution. Ultimately, the institutions of the past were imperfect. I don't belong to any fraternal institutions because I find them kind of weird and creepy. But we can't let our desire to avoid imperfection keep us from building meaningful bonds. When I was a freshman at Stanford, I became very close with my freshman dormmates (happy birthday Mike!). The six of us who lived on the first floor of Alondra (plus our other friends Rock and Kelso) have been together ever since. We all live very different (if first world) lives. Not one of us shares a profession or even an industry (in order: early-stage startups, hardware engineering, law, market research, medical research, non-profits, management consulting, and financial services). Yet what I know is that we've known each other at our worst, yet still stick together. Maybe Walter Kirn didn't have that much in common with the Mormons who took him in. But did that really matter? As imperfect a match as a depressed middle-aged apostate and 20something devout Mormons might be, simply eating ice cream sundaes together helped turn his life around. I think we all have a need for community--repeated, unplanned interactions with a group of people that accept us--even if the pieces fit together imperfectly. I think that religious organizations like the Mormon Church, wittingly or unwittingly, have built a culture around meeting both of these needs. And in doing so, they provide great benefits to their adherents, regardless what's in their theology. In the 2002 Disney movie, "Lilo and Stitch," the titular character, a genetically engineered space monster, finds itself part of a strange little community: Two orphans, a government agent, and two aliens--one a mad scientist, and one a bureaucrat. You couldn't find a more imperfect bunch. Yet with them, he finds happiness. Fred Rogers died of stomach cancer the year after "Lilo and Stitch" came out. I don't know if he ever saw the movie, or if he would have approved of everything in it. But I know he would have been proud of its message. You're spot on when it comes to the intended approach of being LDS (Mormon) and community. While it's easy to see the act of proselytizing, it's just as important, if not more so, to provide service, community and welfare for all those we can come in contact with. One of the initiatives I'm most excited about as a church member is called JustServe (http://www.justserve.org/) where members (and anyone) can connect talents with projects. If we're remembered as the church of companionship, service and community, and not so much as aggressive proselytizers or teetotalers, we're really on to something. It's also impressive to see how well Mr. Rogers is thought of now that he has passed on, as our generation has grown up. I love the insights here, and I think they explain a lot about love and distress in the modern world. Humans, according to E.O. Wilson's new book, are "eu-social" and hard-wired for this sort of "altruism" (which is a feature of group advantage in evolutionary terms.) What may be going on in the Mormon case (and in Evangelical churches, it seems) is the virtuous circle of reward and feedback to the individual who contributes, selflessly and happily (like the UCLA QB). I love the idea behind JustServe. It really plays to the strengths of the LDS. I've never met anyone who knows Mormons personally who manages to retain a prejudice about them. I think South Park did a great episode on this a few years back. The more that members of the LDS interact with other members of the community, the more people will come to see this. Thanks for bringing up E.O. Wilson's work. Group selection and eusociality definitely help explain on a societal level some of the issues I was writing about on a personal level. I'm glad that you liked the piece. I know you're incredibly reflective about your own life, which means you've also thought about these issues. I just wish people didn't see matters of religion and faith as black and white; while I believe that people have a right to disbelieve, far too many also abandon the community concepts of church when they turn from its theological teachings. This is a very thoughtful and wise essay, and I'm honored to be mentioned. The nature of Fred Rogers did indeed play into exactly what Chris is writing about. These lines jumped out at me. "I think we all have a need to be known, really and truly, and then accepted for what we are. Call it love. Call it friendship. Whatever it its, we need it." I'm deeply honored that you stopped by to share your thoughts. I'm incredibly grateful to you for sharing so many of your experiences with Mr. Rogers. A number of my friends have already assured me that they'll be getting their own copies of "I'm Proud Of You." I've spent a lot of time in various types of intentional communities and co-housing communities in different countries, and I feel like startups are often not that different... lots of time spent together, putting our heart and soul into working toward a collective goal. And the friendships can last a lifetime. Chris, in my re-blog of this great post, I hope you don't mind if I used your classic picture with your dog Kobe! I'm glad you like the photo with Kobe! It's actually what I use for my desktop background. Co-housing is a great situation if the people are aligned. I'm very behind that concept. It gets harder when you have kids though.